In December 2017, results of Screen Reader User Survey #7 by WebAIM were released. The survey was conducted in October and had 1,792 valid responses. The survey had less respondents than the previous survey, but had better world-wide representation. Primary screen reader usage: JAWS 46.6%; NVDA 31.9%; VoiceOver 11.7%. CAPTCHA remains the most problematic item. The second most problematic item is now “Screens or parts of screens that change unexpectedly”. This is surely due to complex designs and SPAs/JS frameworks. Web accessibility basics (keyboard access, alt text, forms, headings, data tables) are still in top 10 of most problematic. When asked if more accessible web sites or better assistive technology would have a bigger impact on accessibility, 85.3% responded more accessible web sites. Sadly, frequent use of landmarks and regions dropped to 30.5%. WebAIM states that this may be “due to infrequent or improper usage of landmarks/regions in pages”. 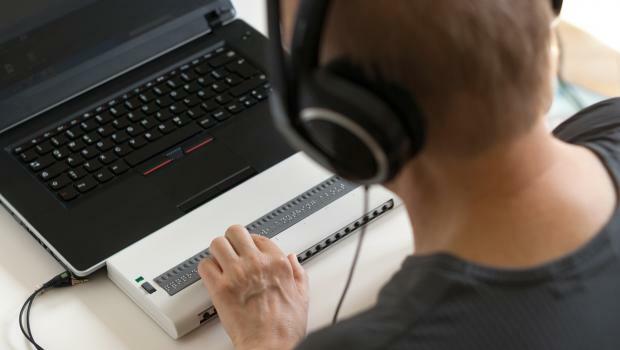 33.3% reported using Braille output with a screen reader. 41.4% reported using an external keyboard with a mobile device and screen reader. I highly recommend you also read WebAIM’s summary of Screen Reader User Survey. Digital accessibility experts are often asked about the usage of screen readers and assistive technologies. For example, one will often ask “What’s the most popular screen reader?” This is difficult (if not impossible) to determine technically, but also has privacy implications and other problems. The following two surveys provide great data and are provided by very reputable organizations. Keep in mind though that the respondents were not controlled and the sample sizes are relatively low. Are you aware of any other recent surveys? A person using assistive technology. As you may have heard, the results of the fourth WebAIM screen reader survey are now available. The survey provides valuable information on about screen reader users such as primary screen readers used, browsers used, and reasons for use. The presence of inaccessible Flash content. CAPTCHA – images presenting text used to verify that you are a human user. Links or buttons that do not make sense. Images with missing or improper descriptions (alt text). Screens or parts of screens that change unexpectedly. Too many links or navigation items. JAWS is still the primary screen reader, but usage continues to decrease as usage of NVDA and VoiceOver increases. The perception of accessibility of web content is decreasing. 72% of the respondents use a screen reader on a mobile device, up from only 12% three years ago. iOS device usage is significantly increasing and well above that of the standard population. Screen reader users represent a notable portion of the iOS device user market. Usage of Android devices is well below that of non-disabled users. The use of properly structured headings remains of great importance. My Take on the WebAIM Survey (by @TerrillThompson) Highly recommended. First, Dennis and Ross discuss a variety of topics including some current surveys and a couple articles about skip-to links. Then Dennis speaks with @JoeDevon and @Jennison about the inaugural Global Accessibility Awareness Day! Positive email response to Disability.gov critique. Liz Ellcessor Ph.D. candidate in Media & Cultural Studies at U of Wisc interviews Dennis (Malware warning due to hosting issue). New! a11yBuzz by @KarlGroves, an “accessibility body of knowledge”. 2 updates (validation, open in other browsers) to Web Accessibility Toolbar 2012 by The Paciello Group. Seeing more accessibility jobs in general lately. Hiring good web developers at PayPal in San Jose, San Francisco, Austin; contact @DennisL. Blind or low-vision users, complete AFB’s Survey on Travel Website Accessibility. Short survey by Blind Bargains to improve accessibility to flowcharts on mobile devices (must log in). Survey on Books & Accessibility for person with disability, special educators, parents; from @Barrierbreak. Skip links on mobile and tablets by @iheni. Article by @TerrillThompson “Back to Basics: Skip to Main Content Links“. The Mobile Website Debate (Jakob Nielson vs Josh Clark vs Ross Johnson). Usability Principles, Accessibility Style, a 3-part series by @AquinasWI. Good examples of accessible websites by @TerrillThompson. Wednesday, May 9; first one ever! Twitter @GblA11yDay and hashtag #GAAD. Event in Los Angeles featuring Yahoo!’s Todd Kloots and Victor Tsaran. Melbourne Breakfast Meetup led by Adem Cifcioglu. Event in Toronto, Canada, at OCAD University. Event in Mumbai, India sponsored by BarrierBreak Technologies. WebAIM’s Screen Reader Survey a few months ago (October 2009) sure drew a lot of attention, and for good reason. It is a much needed and well written survey, performed by one of the leading organizations in web accessibility, WebAIM. Here are some articles written in response to the survey. If you know any others, please leave a comment and let us know! The most problematic items seem to be the same predictable items, unfortunately. The top 10 includes CAPTCHA, Flash, alternative text, forms, and headings. 42% surveyed said they didn’t know ARIA Landmarks for navigation existed. I highly suspect this number will steadily decrease. Although over 66% of users reported JAWS as their primary screen reader, almost half said that free or low-cost screen readers (such as NVDA or VoiceOver) are currently viable alternatives.